Best app to date !!! Very accurate measured by three different devices !!! How can map my run and Spotify be more compatible? This app should sync with the UA Record and My Fitness Pal but I have been having issues with that sync. Also I have question on the amount of calculated calories I burn during my run(I think it is rather high). But the app had good gps tracking and allows me to listen to what I want during my runs. I love the new integration with Apple Watch. Long time user - simple interface means no futzing needed before your run - just click and go. Love this app! Connecting to exact songs is an issue I am having. Use it 3 times so Faron 2 occasions running the same route. The fist time it said it was 2.43 miles......the 2nd..... 1.6. As my son would say, what the what the?????? I have been a long time user of this app on my phone, but it does not work well on my Apple Watch. The pace per mile is completely wrong/ inconsistent, even after I attempted to recalibrate. It also seems to block the Watch getting a cellular signal (I almost always get the red X when the app is in use). And if I try to use my phone for a more accurate pace, it doesn’t mirror on my watch so I still have to control through my phone. Plus auto pause does not work and manual pause is super clunky. Unfortunately I think I’m going to switch to a different app entirely for phone and watch. Changing my 5-star review - I loved this app but it no longer tracks my movement (distance stays at 0.00 miles). I tried to find a contact email/phone number on MapMyRun.com but the “contact us” page just directs to to a FAQ page. Too bad, I recommended this app to many people and I will no longer do so. So I had MapMyRun and MapMyRide for a while. I opened MapMyRide last night and it said the developers no longer updating this app please download the new version. So I downloaded a second, similar looking MapMyRide. So now I have two MapMyRides and one MapMyRun all of which can map my ride or run?!?! Which is the focus? Couldn’t it just be one app called MapMyRunRide? Please point me in the right direction. I use this app to map out my dog walking routes. The walking is a part of my recovery plan for after Crossfit. I’ve been running the same rout for a while and I know where all the check points are. Yet all the sudden the gps for this app is all over saying I’m running in the middle of the grass when I’m on the road?? It is making my distance short and it’s aggravating. Please fix! I have used this app for a long time. I find it just slightly more accurate than the apple Nike app. I loved the coaching, auto pause and music features. However none of these work when using the watch with no phone. I will still use it, but won’t be renewing my premium subscription since none of those features work with the Apple watch. The goals are set up by miles and time. It also tells you how many minutes it should take to complete the miles. This I love however the voice coach tell you your speed in miles per hour instead of minutes per mile so hard to know when you are meeting your goal. I wish the 2 formats could match. My second issue is I love that I can set up training to prepare for a race but I don’t like that the minimum goal for running seems to be a 12 minute mile. I wish this could be adjusted because I’m at a 14 min mile and it’s frustrating I can’t meet my goal and by they time I’m getting closer to meeting it the minutes per mile is decreasing so I’m constantly behind. If it could be adjusted for slower runners it will be more beneficial assisting in improving your minute per mile. Overall the app does help me stay on a running schedule and I live the interval training even if I can’t stay at the speed it is instructing to run. Lastly the goals are miles and minutes for example run 2.2 miles in 32 minutes. But the voice coach will tell you that you’ve met your goal when you reach 32 minutes even if you haven’t met your mile goal. 5 mile walk said I was at a mile way before the mile mark. I love the map function. Please include option for HIIT miles in free app if not there already. Always good to use the application. Very sophisticated in particular. Been using this app since 2010 and have always loved it. The ‘Application Termination’ notification happens every couple minutes of my runs now and is irritating! Can you fix this? I’ll use endomondo until this is resolved. Thx! I’ve been needing an app to help me keep track of how much I run. Turns out that UnderArmor saw me coming. Thanks for the app guys! Low mileage runner...9 mi is a good week. This APP works very well for me! I have never written a review for an app, but this one is very necessary. I've been a very active runner and since buying a new Apple watch, I've been trying to find the BEST app to track my long distance runs. From seeing so many positive reviews, I thought I'd gives this app a try. Unfortunately this app is very inaccurate. I ran 3.65 miles, but the app tells me I only ran 1.29. Horrible app. Do not recommend. Deleting ASAP. DO NOT USE THIS APP!!!! If I could, I would give this app 0 out of 5 stars. At least 4 times I have finished a run or MTB ride to find the app just stopped and did not record. Was never able to post on Facebook, latest issue is continuously asks to log into Facebook after workout. Lots of other running/biking gps apps out there. Just downloaded this today...so far so good! We’ll see how it does as time goes on. I had the older version of this years ago...I look forward to seeing what has been added/changed. I love being able to map my own route! I'm done with this app. Every time there's an update, there are issues with recording and writing data to my activity app. I've lost streaks and awards on the apple activity app because map my run chooses to write data for an entire day and retroactively erase calorie counts. I've submitted reports and talked with tech people and they have no answers and then the next time there's an update, it happens again. I'm done. Easy! Set your goal and track away! GPS tracking is way off like the others have suggested. Please fix ASAP. Never used to have this trouble. App has been working pretty decent until recently. I began my workout today and there must be a glitch somewhere because the app recorded me running at a 5:58 min/mile pace which is 2-3 minutes faster than my normal pace. Very misleading especially while trying to prepare for a physical fitness test. It stopped tracking my run. No mileage or pace. Pauses for no reason. Not sure what changed, but in last week app now cannot maintain accurate position and crashes to where data is completely useless. Will be switching to a run app that can actually do its most basic function. I ran high school cross country for 4 years and my PR in a 5k is 18:15. Well it's been a few months since I graduated High School and I'm just starting to get back into running. I am on a workout right now and at the 3 mile mark it tells me I'm at a 17:00 flat. It seems a bit odd that after taking a couple months off and only being about two weeks into training that I broke my old PR. Maybe I'm just that good lol but I highly doubt it unfortunately. Is this a problem with the GPS in my phone or the app? And is anyone else experiencing this? Unfortunately still the same syncing issue with AppleWatch. Just doesn’t work. Thank you for your time. Use to be able to sync flawlessly with my iPhone 6 and Apple Watch 3. Both have the latest versions of Apple’s software. Don’t know what happened after the update of Map My Runs software, but it’s kind of useless if it doesn’t sync with my Apple Watch. I dropped Runkepper for this very issue. I’d hate to do that with this app. All in all it’s a great app but it seems to have hit a road block. I hope that it will be corrected soon. I have gotten a response from, I believe the devs, and was told to try the latest update for Map my Run. I have updated to its latest version and will be using this today, 4/20/2018, and see if it has remedied the sync issue. As per tech support, I have uninstalled the app for it only to work one day. Went for a run today and the sync issues have returned. Sadly, I feel I'll have to look for a different running app. I’ve used this app for about 2-3 years. Perhaps when the issues are sorted I can use it again. Final fantasy 4 app requires you to make moves to clear the ad. I would change my rating if this ad was removed. I have used this app for my 6+ mile runs and around the 6th mile it stops playing my Spotify music and automatically switches to my iTunes which I do not use anymore. When I switch back to Spotify, the voice coaching stops working. I need the voice coaching to stay on pace and when it stops working I get very frustrated. Pleas fix this bug soon! Latest update took this app from great to useless in tracking my rides as it no longer can track my entire ride. At around 11 miles or so it starts to quit. It starts deducting calories as I ride instead of adding calories ext. Not sure what you guys did but please figure it out and fix it as you will defiantly be loosing users of this. I’m currently looking for alternatives. I’ve used this app for five years, and in the past few months it’s performance has significantly declined. The GPS fails to work frequently-I can apparently run a 2 minute mile. This has happened multiple times, and every time I get the same response to restart my phone and redownload the app. Pretty sure you just need to fix the app. Don’t get a subscription, you will have to jump through hoops and get iTunes to cancel it!! App crashed and doesn’t want to open anymore! The app has been terribly inaccurate recently! At my 3/4 mile point it did I was 1 mike in and continued to get worse and worse. From the path it was mapping it seemed the GPS was jumping around a lot. Fix soon please!!! Without this app and the 10000 steps for Fitbit I would look like a character from Wally! Sync's great with Bluetooth headset. Almost perfect with my Apple Watch... pause button works but not the finish button. Huge improvement though from last year when it didn't work at all with the watch. Keep at it MapMyRun! It's the only app I use for my runs! My only criticism is that it shows that I ran in a town about two towns over from where I actually ran. Street names and GPS map display of the run is accurate. Just the town is wrong. Other than that, great app! The app and pauses and confusing to start back from where you were. Biggest issue is that you can not turn off coaching after you enable it for a run. You also can not change the frequency of the coaching other than the preset settings. You might also want to set personal goals but the app doesn’t support it. It should give you break down of 5k time even if you are running longer. At my half mile mark my app said had already run 3 miles. I’m another tenth of a mile it went to 4.3 miles. What’s up? 8 week Training for the monster tri in October. First week in the books. My body feels old. I purchased their training plan and ten weeks in it stopped increasing the miles each week. Every Sunday it would reset to the same miles as the week before. Reported the issue and after a week of multiple emails and being on the phone for half an hour I still haven’t gotten any resolution. All they can say is that they will report the issue to their tech team. That doesn’t help me given I am ten weeks into a fifteen week training plan. Choose another app. This company really doesn’t care. Love the App! For running and mountain biking! Been using app for years and loved it. However went out for run today and it did not record the mileage correctly? Said I did almost 9 miles but only did 6. I used to love this app bc it was so accurate. As of the past couple months, it was has become very glitchy and will not record my mileage or time accurately. For example, at a .5 mile point, it records that I hit a mile at a 6 min pace. Neither time nor distance is correct. I tried reinstalling, restarting app and phone, but it still is inconsistently recording. I’ve been using MapMyRun using an iPhone 5S on the Verizon network for years and the running app has always been reliable. Within the past week, during my last three runs, with the flip of a switch the quit quit working correctly. One time the app reset itself during my run, sometime after it had provided the initial “start your run” notification. The voice feedback (set to work at 1 mile intervals) works only sometimes. It either doesn’t work at all or if it does work, it’ll provide feedback add odd intervals, such as 2.6 miles, 3.4, 3.9. The mileage is inconsistent too. It’ll say I’ve ran 0.71 miles when I know with certainty that I’m at the 1st mile mark. It’ll say I’ve ran 3 miles when I’ve actually only ran 0.25 miles. Even in major cities with five bar service. What a joke. The app crashes 3-4 times almost every time I use it. I’ve tried different version of the app, different OS versions, and different phones. All with the same result. Recently also had issues with GPS accuracy being off by about 50%. Been using this app for years but I think I’m going to have to look for something more reliable. For some reason, the app changed from tracking my pace to tracking WILLpower & heart rate. Why? I can’t find where to switch back. Help! Hasn’t tracked pace properly, seems to have more issues the more it’s upgraded. Less accurate. Been using app for years. Lately running same route and same mileage. Mileage is off at least a half a mile. Now says 2 1/2 miles before my turn around. Provides a nice place to recall run route. I like how it connects with the nutrition app (Fitness Pal). Works with music apps (I use Spotify) to tell you your runtime while still listening. Great for the organized athlete. I recently updated my app, and I have had errors on my time and distance tracking since the update. I typically run a 7:40 mile (+/- 15 seconds) but have had a range of <6min to >11min per mile since the update. Half the time this app will miss big chunks of my run (around 1/4 mile) and the more often I run the more inaccurate it is. But it’s better than nothing I suppose. Look at your emails , lots off money off products!! Love it ! I agree the app drains your battery. It also tends to pause in the middle of a workout and doesnt track properly on occasion. The GPS is off and my shoes are never in the gear tracking. When running with an Apple Watch, sometimes the app and watch don’t sync. Otherwise it’s amazing. This app is so easy to install and use. I love all that it offers. Thank you! Ever since the update, the app is adding crazy miles to my run. No accuracy whatsoever. Highly inaccurate, inconsistent and not reliable. Wide variations in distance recorded. We’ve been riding hard and thank goodness for this app! We were lost at Beaver Creek and we got back thanks to this!!! I would give this app a 5 star if the measured distance was accurate. Because I carry my phone in my hand, it calculates more distance covered than actual distance ran. I ran a 10k race and Map My Run showed over 7 miles that I ran when it should have been roughly 6.2. This app is garbage and customer service is awful. I have been using this for about a months and liked the free version so I upgraded to MVP. 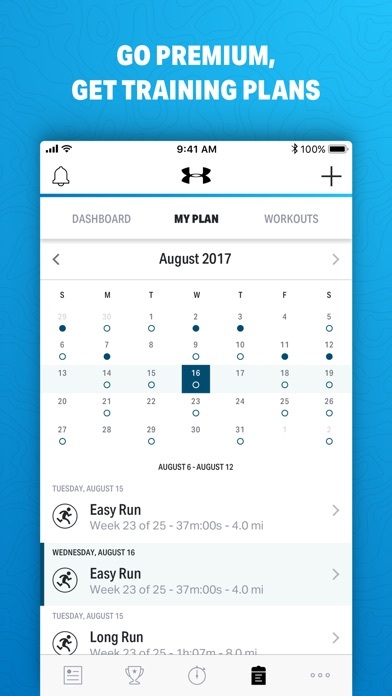 Since upgrading, the app uses my route pics sporadically, I can’t see my training calendar from my desktop (only on phone) and can’t print out training program. I emailed customer service but they are not helpful and barely responsive. Extremely disappointed because this could have been a good app. Similar to what others have said, the app gps is completely wrong and not accurately recording miles. I was so excited to beat my personal best only to find out that the app was duplicating my route. Please fix!! Just wondering why my friends use different apps and all the miles are different as well as calories? After using the app for almost 4 years, it has gotten to the point where it doesn’t accurately track my mileage or time. Don’t use this app, it has gone downhill in the last year. This app is fickle. I start at the same tree each run, but my distance to the first and second mile vary. The pause and resume often malfunction screwing up my average pace time. Nothing worse than knowing you had a good run, dripping in sweat in this southern hell to see the app has resumed on its on. I love how I can record my runs, hikes, bike rides and how many calories I burn while working out. I always know how many calories I am burning and don't have to make estimates of how I am burning. It works awesome!! Best app I’ve ever used! It would be nice if every half and mile I was told my distance and time. That would be encouraging. Otherwise it’s a great app. I ask for a password reset. And underarmour uses this opportunity to immediately spam my email with their advertising instead of sending a password reset email. Ridiculous. Update: 12 hours later and I still don’t have a password reset email as requested. Love mapping my run with Map My Run! Grateful for this wonderful app! Excellent tool to help commit, track, learn and improve running skills. I was surprised to see how much I improved on the weekly fitness reports. I had no idea how far my runs were until using this app. No issues with the app itself but if you are going to force ads please make sure that they can be closed easily after the commercial. The White Claw add has the smallest “x” I’ve seen and it blends almost perfectly into the background. Tracks every step of the way, not sure how I would run without it! My husband and I have both use this app on our phones for years, but since the early spring, the app no longer works consistently (despite deleting and redownloading). In order for it to function, we have to turn off WiFi from our phones before leaving the house; otherwise, it completely miscalculates mileage. Also, the auto pause function no longer works: once it pauses, you never know if it’s going to start again. Frustrating as we both lost multiple workouts before we finally just gave up and turned off auto pause. Although we have years worth of workouts on this app, we will probably switch to one that’s reliable. Vocalizes & keep your time & distance. But after my workout, I forget to click the Hold to Finish button, although I’m idle the time is still running. Needs a notification to ask me if I’m still working out? I don’t know if it’s my phone or this app. I run on straight roads and when I review the run it appears that i cuts corners and run through neighbors’ yards. It’s all over the place and I can’t rely on it to see how many miles I ran. I don’t live in an area with unreliable cell service and I have Verizon so it’s not my service. Perhaps my phone is not tracking gps accurately anymore. I never run without it running as well!! It is awesome!!! Thank you!!! I apologize, and my original review I thought I was reviewing the Aaptiv app, not this!!! Been using this app for a while. Recently stopped working. Since last update I’d assume. Crashes or pauses the workout every time I get a few minutes into a run. I never notice cause I’m running. When I finish the run nothing’s been tracked, which is obviously disappointing because that is the only purpose this app serves. Worthless until this problem is fixed. I know a few other people that are having this problem and after reading the reviews it seems that this app is becoming obsolete due to this problem. As much as I love this app I’m relatively sure I didn’t just run 8miles with a 4:06 min miles avg ! But thanks! The app is really great and helpful, I use it all the time. However, I’m having trouble connecting the My Fitness Pal App with Map My Run via Facebook. I go to connect, it asks me to log into Facebook, then the screen says it’s connecting but it doesn't do anything. I’ve even let it sit there for 30+minutes. You may remember how far you progressed over the many months of your training but I am not as good at it, that’s why I enjoy using this app. I also can play my own music I have on my phone while using the app. Overall, this app seems to keep track of my run, yet I can apply privacy settings. Just kept making me signup and then giving me an error. Y’all need to do better. Just downloaded the Nike one after and it worked first time. This was a miss. I will likely buy Nike shoes next time as well since they have their stuff together. This app has greatly helped with motivating me to go out and run more often. Map my run is very user friendly. I recommend it for any and all runners/walkers out there. Keep up the good work! I love this app! I just started running this year and I couldn’t have done it without map my run. 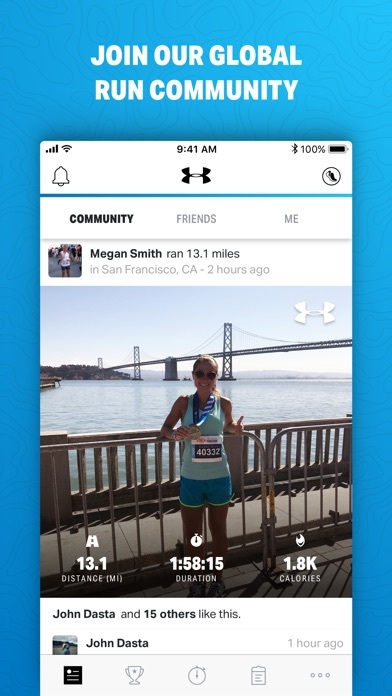 The app keeps track of how far you run and updates you with every mile you accomplish. I have ran 4 miles! I never thought I could! Now to reach 5! It stop before I finished. This is a great app! It motivates me to push harder on my next run. 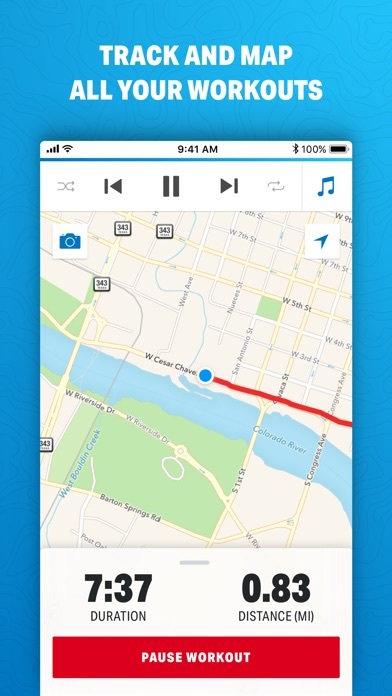 This app tracks route, gives audible updates every mile, and logs runs etc. My only issue is that if ur listening to iTunes prior to launching app, it will switch playlist from random play to sequential play. You have to go back into iTunes and restart play as random. Although I understand the functionality of tracking your runs with the apple watch only, I use the music on my phone to keep pace. I'll like to see an "opt in" option where the app is mirrored on both the Apple Watch and the iPhone like it used to be before the update. Will re-rate the app if ever resolved. It decides to update itself mid-workout. Happened 3 times already. Fail!!!!! 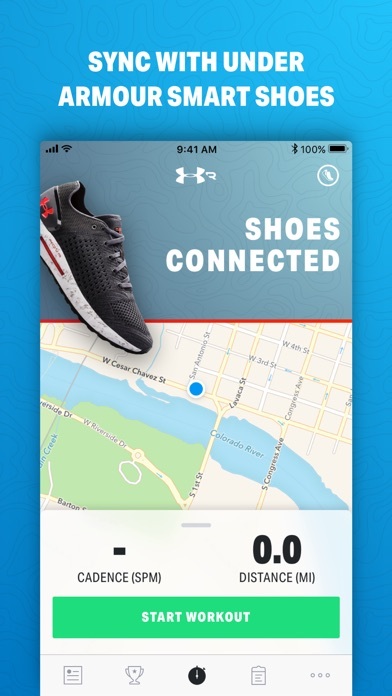 Since Under Armor took over this app has not worked. Times off, distances off, very frustrating. Will look into other tracking apps as this one is pretty useless now. Disappointing as have used for years. Doesn’t seem to sync with my Apple Watch for an accurate log. That’s why I paid for the MVP. Great App. Helps to motivate by seeing results. Beauty of app that you always can count on it’s track! I’ve been using MapMyRun app 4-5+ years really love it , I began using it for my running but because my bad knee I stop running n I started using it for my cycling it works Great and so well for me, That’s all I use when I go out for a 20 0r 40 miles bike ride .... awesome app! Please change the GPS pause setting back to where it was a year ago. I can no longer make up time that the GPS failed to record. Plus, when I pause it then restart the average pace never resets. I’ve been using MMR for years-well before it was purchased by UA. I’ve logged thousands of miles; First on my phone then on my Apple Watch. Updates have been great, but support for the Apple Watch is lacking. The Watch app tracks fine, but it literally takes days for a run to post to MMR (phone and website), and sometimes it just never transfers. Frustrating. I finally switched to STRAVA and find that runs recorded on my watch transfer immediately after being paired with with my phone. Perfect. Just how it should work. Fix this MMR and I’ll come home, but otherwise it’s not worth the aggravation. I purchased an iwatch for music, podcasts, and run tracking. MMR just hasn’t been holding up its end of the bargain. My two main complaints about the app MAY be hardware related. First: It does a really poor job of communicating between the Apple Watch and the phone. Terrible. I simply cannot use the watch app. Second: The distance never seems to match chip time during races. And. It even consistently behind it ahead. I realize that GPS will always be off from the chip but this one seems excessive. I have used this app a couple times to keep track of my pace while I run half marathons, and it always tells me I have reached mile X before the official race mile sign. Takes too long to start and stop. Make sure you have ONE account and stick with it. If you do and you are an avid runner you will love this app. Customer service may write back quickly but they don’t have good access to your account if you have technical issues logging in. Great App for ANY runner, new or seasoned! You can get plans to accomplish what you want, actually log exactly how the session went and see all the information regarding your run in this app. LOVE IT! Seamless connection to my work out, works great! My Apple watch 2 and 3 both lose runs on a regular basis with MMR. I tried rebooting watch, phone, wifi router, killed/restarted the apps. Nope. Gone. Strava was doing it too but, Strava has a “sync” button and a way to view activities stored on the watch. Didn’t realize that before you may want to do the same. Otherwise, an app that is unreliable is useless. This app constantly nags for reviews. I changed the iPhone setting so apps wouldn’t request reviews, but this app still asks. Map My Run also sends notifications for irrelevant things. There’s a new challenge? Let’s send an alert! Under Armor is having a sale? Let’s send an alert! Dicks has new stuff in stock? Let’s send an alert! Ugh, just stop. Please just record my workout, and let me get on with the rest of my day. I want to start by saying I love this app! It’s really easy to start a run and to get back into exercising. I love the challenges because they inspire me to run. And it’s great that can compete against friends. The only thing is that it drains my battery very quickly so you had to make sure your phone is well charged before you go on a run. Another thing I’d like added is if I go on a run and I forgot to start a MapMyRun or when I am adding in one of my runs to the program, I’d like to load my routes. You can choose from the routes you’ve done, but I wish that you could draw out where you ran if you went on a new route. Overall this is a great app. I just think these things would make it so much better and easier! Loved this app for the first couple weeks but for the last week it’s been crashing towards the middle of my run so it only records half of it. Kills my momentum! Up and down more than I understood before I used this app. Accurately follows my street walk. Have been used it snowshoeing. So I like to run and then swim a few hundred meters and then continue my run. I pause the run but the overall time still ticks away. How can I change this? Or can I change it? Latest version erased all my data!!!! The latest update just erased all my data from the app!! I had over four years of logged runs in there!! Apple Watch update worked UNTIL... Apple updated the watch. Now... same issue. The app does not sync readily thus the reason for 3 stars. Also the app kills the watch battery Thus... I cannot track a run that exceeds 3 hours on a fully Charged watch. I have used this for a while with excellent results, but over the last few months it has behaved erratically - telling me that I am running a mile in 90 seconds, or failing to detect that I am even in motion. I have tried numerous things to fix it - and even emailed the developer who send me a list if suggestions, all of which failed. I thought it was my phone, but location services works fine for my other exercise app. So until this is fixed, I recommend looking elsewhere. Any time I try to open this app on a run, it takes a full 20-30 seconds to load, during which time it doesn’t accurately track my speed or distance. So frustrating. Half the time during this loading process the app just quits out and I lose more data. I have an up-to-date phone and the most recent version of this app, and this has been happening for nearly a year now. I’m officially switching to another tracker after using this for nearly a decade. So disappointing. Clearly developers have stopped caring about quality. I use Map My Run often. I usually really like it, but I find it can be glitchy and not always resume after a pause. Really good. Helps with school. Recently, when I go on rides, runs or hikes, 1/3 of my data gets lost and not recorded. This is super frustrating for me to the point I’m going to try something different to see if I have the same issues. Other than that I really like the features and Challenges they have. Does not sync with my Apple Watch since iOS update. I’ve used this app for a couple years and now all of a sudden it’s having issues. Every time I try to track my run, the line that shows my path will zig-zag and say that I ran a mile in 7 minutes (I can’t run a 7 minute mile). One time I was running around a lake and the app showed that somehow I had done part of my run IN the lake. Please give the option to change the language of the app. My default iPhone language is set to a different language, but I’d like to keep my Map My Run app under English. It automatically defaults to my phone language. Please, PLEASE give us this option. This is a great app because of its accuracy and because there are sub categories for all the major activities such as a dog walk instead of just a walk. Or interval run/walk instead of just a run. I appreciate that you can be specific. Make sure to document your time as soon as you finish your run. 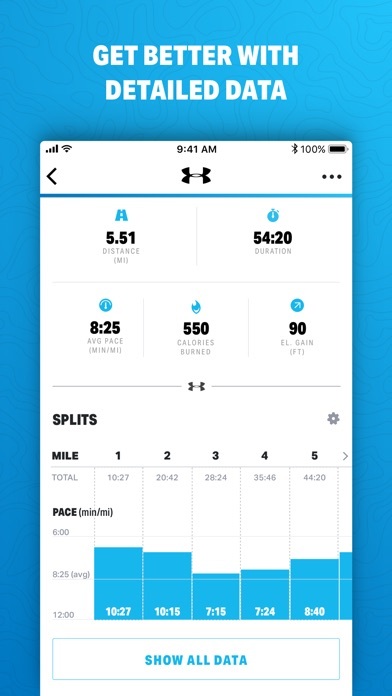 The app adds time to your run after you save it. If they fixed that glitch it would be 5 stars. The god distance is off, like doesn’t always measure same route even close to same distance. This is important when training! Still doesn't sync with apple watch properly in newest 18.10.0 release. Almost 12 hours and run data from watch hasn't synced to the application. Glad I cancelled Mvp membership. Free/junk apps sync health data better. I have been using this app for a long time in the same neighborhood. Cell phone signal is great. The app is fine as far as features go. Now it seems it has GPS issues. When I start a workout and once I am done I am seeing zig zags everywhere and it places me in places I did not go. This has not happened in all the years I have had this app and now all of a sudden it does with the newest update. This needs to be fixed, it is messing with times and distance for runs. Might have to get another app until this is fixed. What’s up with the lag? After the last two updates there is a 4 or 5 second lag after pressing the start workout button and when the timer & distance tracker appear. It’s SUPER-ANNOYING because you can’t tell if the tracker started or if the iPhone just didn’t register your touch, especially considering most armbands have thin plastic that covers the iPhone’s screen. I’ve had to restart my runs a bunch of times because of this and I’m going to switch trackers even after logging thousands of miles if this isn’t fixed. I used to start the app from my phone because I love all the choices there, I can find my specific workout, Insanity.... As I worked out I could check my watch and it would be in sync with my phone and be tracking my heart rate. Now when I start it with my phone and check my watch, it does open map my run, but my only option is to start a new workout, then it logs two. Also, every time I go back in the app on my phone to check my devices, somehow my watch is disconnected and Apple health has to have permission again. This was never a problem before, I really loved using it before all the bugs, unless it’s because I’m not a subscriber anymore. It’s listed as compatible with an iPad. Technically speaking that is correct. It does run on a iPad, but is an iPhone sized screen in the middle of a sea of black. I have compared the mileage of many runs to car odometers and to other apps my running partners use, and the Map My Run mileage is often more than the others’ record. So apparently, I am not as fast as you think! The GPS is frequently off not by much but enough to be annoying. The app is great, and it’s nice that I can run with just my Apple Watch and record workouts. However, it takes WAY too long for the watch to sync with the mobile app/website. After I complete a workout, I like to be able to look at all the statistics on the app or website, but it currently takes an average of 12 hours to sync with the app/website. I should note that there are no issues syncing with the Health app. I did email support and they emailed back by simply copying and pasting what it says on their website, which is open the apps on the watch and phone at the same time, or put the watch on its charger until it syncs. Neither of those “solutions” work. Unfortunately, I paid for the MVP so I guess I will use this until it’s over and then switch to Strava. This app use to stay on so you could see the route you wanted to run throughout the run. But now it doesn’t work. It will show you were you’ve been but not the route you want to take. Pointless. Great at times but frustrating at others. I do the same trail and get different data at times. Great app for any level of runner. Easy to operate and understand. Highly recommend. “Updates” consistently reduce free features and increase ad intrusiveness. No idea why anyone would have this and put up with the ads and/or paying for it when nike has a better app for free. Great app. I have been using for a while, and it has helped me record my progress. Thank you . Very easy to use. Tracks everything essential for simple cardio fitness routine. Pairs with Mio heart rate monitor to give audio HR status. I’m using it with Maffetone type regimen and it works great. Creates routes don’t stay up during a run. I use this app for all of my runs, walks, and hikes and it usually works well. The only thing that has been quite frustrating is the routes function. When you create a route for yourself and choose “do it,” the map of the route only stays up for a short period of time. If I go to a different app or turn my phone screen off, when I come back to the app, the map has disappeared. There is also no way to retrieve the map during a workout. Keep in mind this is coming from someone who can get lost on the way to the mailbox, so I do need to have the route in front of me, especially for new routes and different places. I have used it off and on for little over a year. It has some great workout plans and will send interesting workout info. I enjoy this app a bunch. This app isn’t compatible with Apple Watch functionality. I enabled the activity application and the MapMyRun app and it crashed. Like the app but not sure what changed. Cannot post to Facebook any more. Can’t create a new route in app. I spent 10 minutes trying to log a run I just went on using the app (using ios 12.1 on my iPhone XR) and I ended up giving up and opening their webpage in my browser to create one. I appreciate the convenience of route tracking and all, but if I go on a run without my phone I shouldn’t have to fight to try recording it. All the app would let me do was select previous routes, nearby routes, bookmarked routes, and randomly generated routes. Really a nice program you have, I really do enjoy the features that I get. I like being able to look back and look at the route taken and the mileage points. Just all the information that you provide. Works fine on iPhone. Used to work fine on Apple Watch. Since latest update to WatchOS 5.1.2, the app does not work properly on watch. the app opens but the screen freezes. Mostly good. I’ve been using this app for a while. What I wish it had (it might but I can’t find it) is that I could see my time and miles in my Lock screen. I hate to open my phone and app mid run to see where I am. It would be better if It could be on the lock screen. Fingers crossed. I've used Map My Run for years and it's great. I really enjoy doing the under armour challenges. The under armour challenge is a little annoying though. Either many of the leaders are ultra Marathon runners or some users keep the app on all day just to rack up miles. Also, I wish the challenge was separated by pace. It's annoying when the leaders might have milage but are walkers. Maybe break the leader board up by pace for the challenge. Group by 6 min mile and under 6-8 mile pace 9-10...etc. Just a thought. I have been enjoying this app for years. My goal for 2019 is 600 miles. Can’t wait to do it with this app! Writing this review to avoid further pop ups. But I will still be helpful. Been using this app for a while, whether it’s biking, jogging or otherwise it will always be my go to. My only complaint about this app is I use my Apple Watch a lot and if you don’t bring your phone you can’t get the audio feed back map my run please fix that! Great app. Very user friendly. It not consult trying to sell u something, (only at the end of your run) and it’s usually workout stuff, that goes with your running mode. I have used this app for a long time. Lately it has become a battery hog and it crashes regularly. It seems that any run over 5 miles is just too much now. After that it either closes, crashes the phone, or stops giving any voice updates. This used to be a reliable app. Now I’m looking for a replacement. I live out in the country and the gps gets confused frequently and goes way off my track. This makes it difficult to track my run. If I get locked on an ad one more time without any way of exiting besides closing the app then it’s deleted forever. Ads are lame enough. Don’t do me worse. Been using this app for years until.. This app has been great, and I have loved it for years. However, with one of the recent updates (around November 2018), the app is not tracking distance nor times accurately. It is following 2.25 mile runs as various distances suddenly (as low as 1.69-miles). I have used this app on these same runs before this with no issues and am not sure what they changed, but PLEASE fix it. I would love to continue to use this app. Overall the app is great, but auto pause is not. It pauses a lot when it shouldn’t. I used to always have a great experience w map my run. However, recently the audio statistics I set every 0.5 miles don’t report unless I unlock the phone. And the elevation gain statistic seems to have gone away? Just did the iOS 12 update? Is that to blame. Fix these two issues and my review goes back to 4 stars. Let me post my runs on MMR to other friends in communities like Strava and 5 stars. I finished a run an hour ago and it still hadn’t updated.. what’s worse is that it updated a run I did on Nov 28th! Great app but it won’t sync my run from my I watch to my phone when I’m done. It gets confused at times. It will forget how to link to iTunes. It’s distance measurements are inconsistent. Instead of under armor, it should be called under armpit. I like the app but I have an Apple Watch and if I run without my phone it can take up to 2 days before my workout is synced and viewable on my phone or desktop. The funny thing is that the workout shows immediately in my Apple Health and movement app so under armor is just not syncing the data with their app. Very frustrating. I am considering switching to the Nike App. Does anyone have any other recommendations? I have used this app for years. I love the new update where you can see all your stats (distance, pace, total miles) at a glance! I’ve used this app for more than a year, put over five hundred miles on it. and overall have been very happy with it. It maps my runs, lets me see a few of my friends’ runs, even suggests potential runs if I’m out of town running in unfamiliar cities. Good stuff. But over the past several weeks, the GPS has become all but worthless. It loses my location, “jumps” me a half-mile away to the middle of nowhere, “jumps” me back again, rinse and repeat. By the end it’s added an extra fake 2 miles to my run (and tells me I ran it at record speed!). I am using the app, and my phone, he same as I always have before. I have followed the online help suggestions: closed other apps, made sure Location Services is On, turned WiFi off, rebooted the phone, uninstalled & reinstalled the app. Nothing works. My past 8 runs in a row, none have been accurate. If it can’t actually map my run, the rest is worthless. I’ll give y’all one more update to fix this before I delete it permanently and move along. This is a great app to track your workouts. The gps has a hiccup everyone once in a while, but otherwise it’s awesome. I got the UV HOVR shoes excited to use this app but it keeps saying error when creating my profile so I cant even use it. 18.11.5 now my Apple Watch runs aren’t syncing. Strava is better. Run as a group. Check Strava out. An app made for people who want to do more than just track mileage. Great for runners in groups interested in running together. Easy to use, even groggy at 5:00 AM. Use it every time I’m out of town to find places to run. I love this app! It helps me keep track of my distance and time and really motivates me. Hey does occasionally have a glitch that says I am running a lot faster than I really am but most of the time works right.